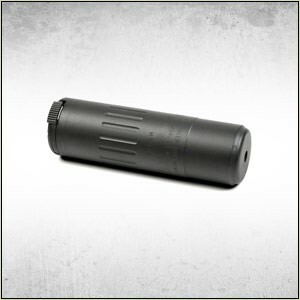 The Mini4™ (5.56) is an ultra-compact silencer for CQC rifles and carbines. Don’t let the size fool you; the Mini4™ is packed with hard-use technology. It has a fully-welded Inconel® 718 baffle core and uses the best-selling 51T Ratchet Mount™ fast-attach system that enables users to install or remove the silencer in seconds. Includes 51T 1/2×28 Blackout® Flash Hider Mount. Although it is designed to present a compact profile, the Mini4™ significantly reduces the sound and flash signatures of its intended host firearms; below the 140 decibel threshold at the shooter’s ear on 14.5″ and longer barrels. Recommended for use with barrels longer than 14.5″ for best results.